Canet de Mar is on the Maresme Coast, 47 km from Barcelona and 59 km from Girona. The town is lodged between the Mediterranean and the Montnegre Nature Park, thanks to which it has a sunny climate most of the year and very mild temperatures. Canet can be reached on the N-II Highway or the C-32 motorway. From Barcelona it takes about 40 minutes by motorway. Girona is an hour away. The AP-7 motorway follows the whole of the Catalan coastline from La Jonquera to the Ebro River and continues to the south of the Iberian peninsula. Via the junction for La Roca del Vallès we get to Mataró and from here the C-32 motorway leads to Canet de Mar. 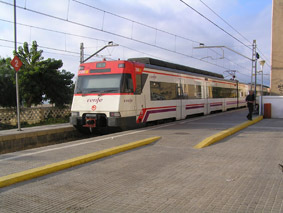 Canet de Mar is connected to Barcelona by the Renfe R1 railway line. The trip lasts around 50 minutes and trains leave every 15 minutes in the rush hour and every 30 minutes during the remainder of the day. To get here from Barcelona, you can catch the train at Sants, Plaça Catalunya, Arc de Triomf and El Clot stations. Barcelona’s international airport Barcelona, El Prat, is 63 km from Canet de Mar. First you get the train from the airport station to Sants station in Barcelona, where another train will take you to Canet de Mar on line R1. Another possibility is by car. In this case, you have to take the C-32 motorway to Barcelona and then the Ronda Litoral ring road to the airport. This airport offers a large number of short and long haul airlines connecting Barcelona with destinations around the whole world. Apart from Barcelona, it is possible to get here via Girona-Costa Brava airport, where low-cost companies operate to European destinations. +Info www.sagales.com Tel. 902 13 00 14.